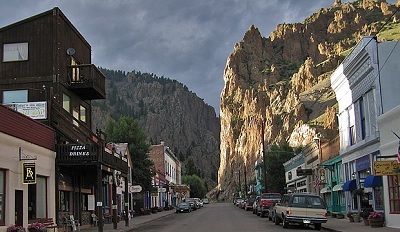 Creede is a great place for visiting as there is much to see and do. Our best friends live here so we spend a lot of time in the area. Located on the far west side of the San Luis Valley it is about an hour and half drive from Alamosa. It is an excellent day trip or vacation destination and will allow you to experience some of the area’s history. 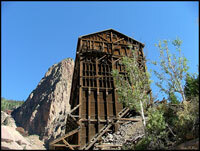 The town began as a booming mine town in the late 1800s when a rich silver vein was found nearby. Today you can still see the remains of many of the old mines that made this area popular. Over the years more than a million dollars worth of silver has been mined out of the area. In 1985, when the price of silver dropped again, the last mine closed permanently. Today, it is primarily a tourist destination. In 2010 the town was the recipient of the Governor’s Arts Awards which honored the best art towns in Colorado. The main street is filled with many unique arts and craft stores where you can buy anything from amazing paintings, to jewelry, to outdoor gear. For being a small town there is a wide variety of food choices, and there is something to eat for everyone. Whether you are looking for a great chuck wagon dinner or something a little more elegant, you can find it here. We highly recommend the Big 6 BBQ. It is right on the corner as you head north into town. Our good friends own it and we assure you that you will have great food and service. Just tell them Debbie and Kaylie sent you. They will know who you are taking about. We also recommend attending the "Taste of Creede" which is held every Memorial Day Weekend. Don't miss the Creede Salsa Festival where you vote on the many different kinds of salsa you get to sample. 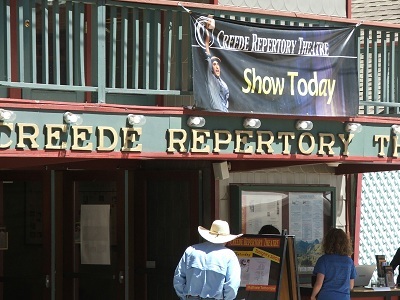 The internationally acclaimed Creede Repertory Theater is also found here. With affordable tickets, it is a great way to spend an evening. With several different shows every summer you will be sure to find one that captures your attention. Do you want to learn about the history of the area? Then the best place to visit is the Creede Museum. Are you also interested in learning about mining? 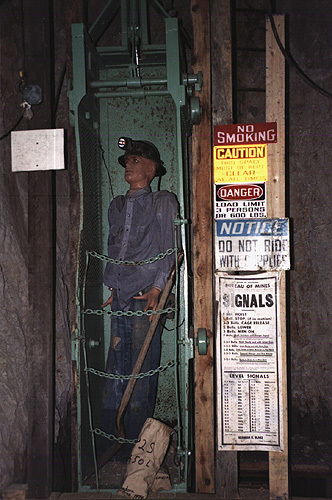 Then you must visit the Underground Mining Museum. Its name says it all as this museum is actually underground. A solid rock wall was blasted out in order to create the museum. This allows people to get a glimpse at what it is like to be a miner. With guided tours (reservations needed) given by retired miners you will learn about the equipment and methods of mining. There are also self guided audio tours which allow you to take your time. Don't you just love the town of Creede? Click here to share! For the outdoor enthusiast there is something for every season. There are thousands of miles of trails just waiting to be explored. In the winter you can find cross-country skiing, snow shoeing, and snowmobiling. There is also an ice skating pond as well as excellent hills for sledding. During the spring, summer, and fall the trails become great places for hiking or running as well as horseback riding. Want to see the beautiful scenery but still remain in your vehicle? There are many four wheel drive jeep trails to explore. A great way to explore from your vehicle is to drive Bachelor Loop. Bachelor Loop is a 17 mile driving tour that loops through the town's historic silver mining areas and ghost towns. Both the Visitor’s Center and Chamber of Commerce offer a 25 page guidebook (cost $1.00), which talks about different points of interest on the drive. The road has some narrow stretches and steep grades so please use caution, especially during bad weather. There is so much wonderful history you should plan to spend at least an hour taking this drive. 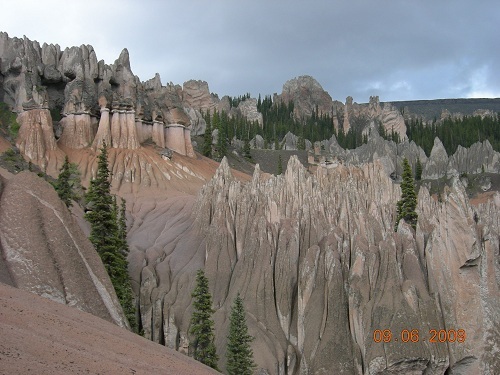 Another great but extremely bumpy ride that is close to Creede is the drive to Wheeler Geological Area. 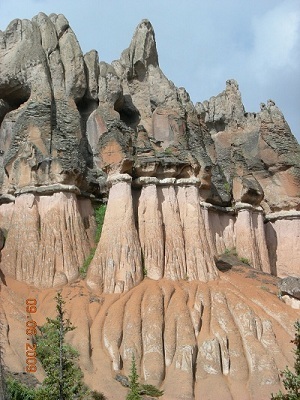 This area was formed when the area was active with volcanoes, and it requires four wheel drive to get there. For the Fisherman in YOU. . . If you are looking for great fishing you have come to the right place. With the Rio Grande River headwaters starting in Creede’s backyard there are excellent fishing opportunities. You can expect to catch lots of rainbows and browns, many in the 16-20 inch range! The best fishing is from June to October when the weather is the warmest and the fish are the most active. 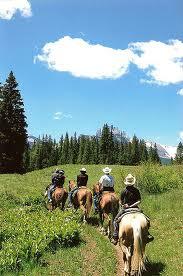 There are also many remote high mountain streams and lakes that can only be reached by hiking or with horses. These offer amazing views as well as solitude. As fewer people make the effort to reach these areas you can catch quite large fish!! 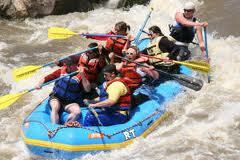 White water rafting is a fantastic way to get a different perspective of nature and it is a great time. Mountain Man Tours offers affordable half day rafting trips down the Rio Grande River. May and June are the best months, but any trip is sure to be memorable. While the area doesn’t receive much rain, there are many waterfalls that can be viewed due to snow runoff. Many of these are unnamed because they are short lived each year. Some of the more stable waterfalls are North Clear Creek Falls, South Clear Creek Falls, Copper Falls, and Phoenix Park Waterfall. There is a wide variety of lodging to choose from which include hotels, cabins, RV parks, guest ranches, bed and breakfasts, and of course tent camping in the wilderness. We highly recommend the bed and breakfast, "Blessings Inn." Our good friend Barb owns it and she will take great care of you! As this area is mainly a summer destination some of the facilities are not open year round. It is best to plan in advance as lodging fills up quickly, especially during holidays and events. So spend a day, a week, a lifetime in Creede and enjoy everything that the town has to offer. Did You Fall In Love With Creede? Do you have a special memory of this unique town? Share it with us!